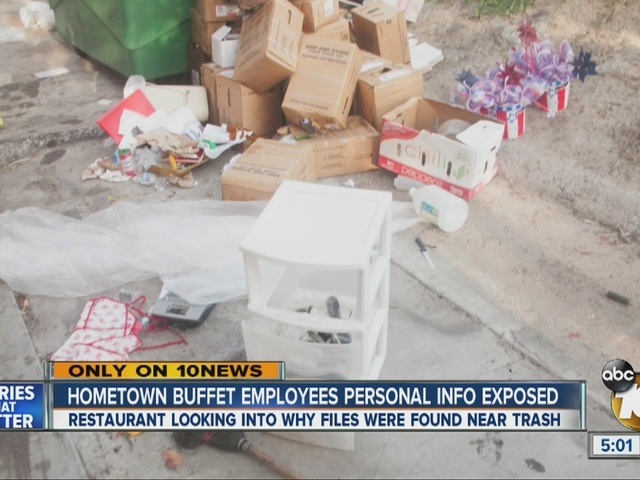 A 10News viewer was shocked when he discovered personal files of former HomeTown Buffet employees. David Good says he found the folders - some with workers' social security numbers - in a white bin near a dumpster outside the shuttered Oceanside restaurant. “This looks like some sort of term and condition for employment and how much they make overtime rate,” David Good said. Good handed the folders over to a company representative on Sunday. 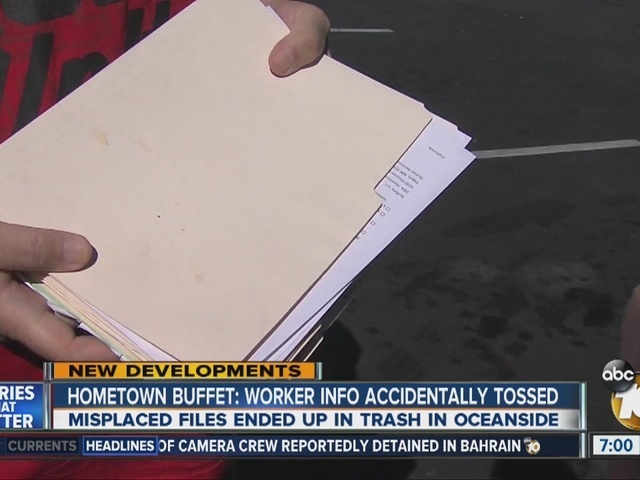 10News called the restaurant’s lawyer pressing for answers about how employees' information ended up in the trash. The lawyer says a manager at the Oceanside restaurant was supposed to pack up all employee documents and ship them to the human resources department in Texas. At least seven files were not stored in the right place, got overlooked, and got tossed. “They were in the bottom drawer for some reason of that plastic container and weren't in the right place with the other files and they were overlooked,” Attorney Laura Worsinger said. California State Law requires employers to keep employees personal records for at least three years. By law, businesses are required to destroy, dispose of or otherwise make personal information unreadable or undecipherable. 10News did some digging and discovered there's no agency that enforces this law, and it's up to employees to raise a red flag when something like this happens. Good says he couldn't keep quiet about his discovery and hopes getting 10News involved will prevent some former HomeTown Buffet employees from losing more than their jobs. “If you can't trust your employer to keep your information confidential, then who can you trust?” Good asked. HomeTown Buffet is offering identity theft protection for the employees whose personal information was exposed.